We are catching up on three card reveals: a Legendary Paladin minion and two Epic ones, one Neutral and the other for Priest. This card can work well with High Priest Thekal in a Heal Paladin deck but that's about it. Blackguard is rotating out of Standard, healing your opponent isn't ideal and the Dragon tag seems irrelevant. Even the healing effect doesn't seem worth it with all that healing that Paladin has received recently. At a first glance, you might be thinking why this guy isn't a Pirate; if you take a closer look, that's not a ship's steering wheel, he is just a rogue hiding behind a carriage. Along with Spellward Jeweler, Hecklebot and Duel!, this is the fourth card from this expansion that can disrupt combos. 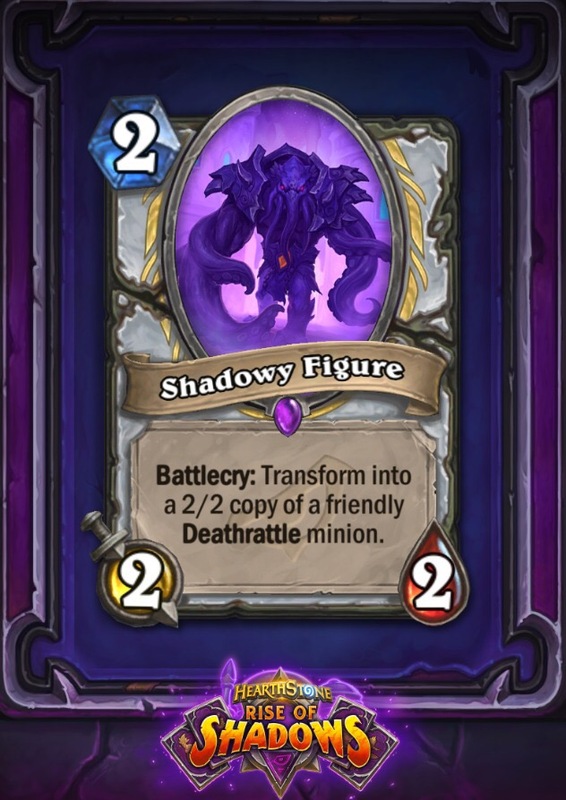 Priest gets another 2-mana 2/2 in Rise of Shadows after EVIL Conscripter. The card can have some interesting applications, but I think it needs more Deathrattle support to see play. I have to say I am disappointed with the Priest reveals so far. It has to be the class with the most callbacks, since each of its revealed cards just hearkens to a familiar mechanic from the class's past (Deathrattle, stealing, Forbidden). The class seems to be heading into the new expansion with no specific direction, just a random mish-mash of effects. Nozari looks like Tree of Life with a body. 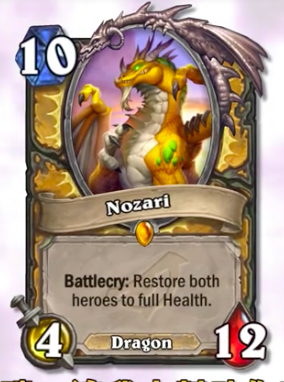 This is the 3rd dragon revealed so far, class-specific again, and not one I'll be happy to get from Dragon Roar, as it can be simply unplayable in adverse circumstances. Clearly the pool of dragons is getting weaker at the moment 😞 The only combination that could make sense is Nozari followed by Alexstrasza, but that's pretty slow. As a side note, I can't believe that Blizzard is banning a player for cheating and just a few weeks later put him under the spotlights for a card reveal. This is - again - sending the wrong message in my humble opinion. I like Unseen Saboteur, body is decent for the price and it should be very fun to play. Efficiency will depend a lot on the meta though. I agree, Unseen Saboteur is a funny card. Body is fair and casting a spell will always be bad for your opponent. Chances, that the spell we be used effectivly are very small. But chances for disaster are high. Buffing the wrong minion (maybe even one of the opponent) - horrible. Almost every spell you have in your hand is usefull - otherwise you wouldn't have it in your deck. (Sure, there are some spells to just draw faster through your deck.) Not being able to choose when you want to play it can be a hard blow. Of course you can be lucky: You do not have many cards and you manage to draw cards for free - great. Unseen saboteur is the simbol of the new course of team 5. Before, they would have never print such an unfun card, that also happen to be that much RNG dependant and win/lose on the spot. This card can be crazy and will almost never miss a target, because all spell are usefull if not primary for every strategy. While this card is thought with combo deck in hand, and there it shows you all the unfairness of this card (get a combo piece = you win, miss combo pieces = you lose; it isn't always true but this is how people will react), but also vs control will show all this strenght: control match are based on resource management, and this is what this card hit most. Incredibly, this is also usefull against aggro, making your opponent wasting precious counted burn on a minion (again, making you win or lose on the spot, or feel like you won or lost on the spot). All of this having stats only 1 mana down from vanilla, and enough health to survive a lot of board clears like flamestrike. This is a lot different from Dirty Rat, because Dirty Rat could backfire too hitting a big minion instead of a good battlecry one, so it was a tech card you need to think if you should to add it to a deck, and if you should to use it this game or not. This is unfairness made card. I won't be surprised if this card will come to dominate the tournament scene (I think actually that this card has been printed with this in mind), and to generate an unsane amount of salt on the players. And I don't understand why they won't print any charge card anymore, but they have started printing hand distruption. However, I love the paladin dragon. I think it will surely be played in a slow control paladin if the meta is right. 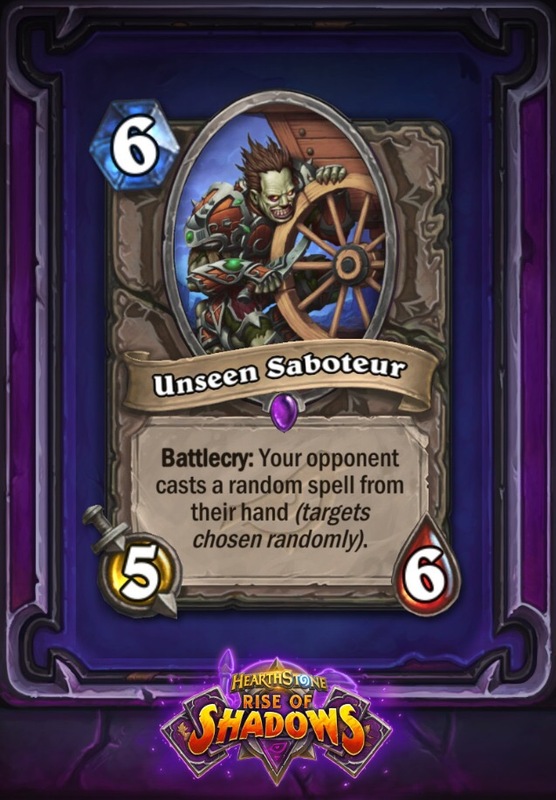 IF I correctly read the text of the Unseen Saboteur, it says: Your opponent casts a spell. Also I'm guessing the spell is then gone, otherwise there wouldn't be much sense behind the card. So the spell triggers not for you. I think some of you missed this. I don't think we did. At least I did not and I can't see anything in other's comments suggesting they did. Yes, this is my understanding as well. Otherwise the text would be "cast a copy", not just "cast".